Oil sands are found in various countries throughout the world, but in vast quantities in Alberta and Venezuela. Alberta’s oil sand reserves are estimated at 1.7 to 2.5 trillion barrels of oil trapped in the complex oil sand mixture, and this represents the largest single reserve of oil in the world. About 15% of this is currently recoverable, which amounts to about 75% of the petroleum reserves in North America. Only recently (with dramatic changes in the way the world views oil reserves) these oil sands have come to be included in the tally of global petroleum reserves. As of 2003, Canada now maintains the second largest proved oil reserve in the world (next to Saudi Arabia). Canada is the largest supplier of crude oil and refined products to the United States and constitutes near 18% of US imports (as of 2007), or about 1.8 million barrels per day. Canada’s bulk production capacity from oil sands is about 1 million barrels per day, and the bulk of this is exported to the U.S. The largest of these deposits is in Canada. 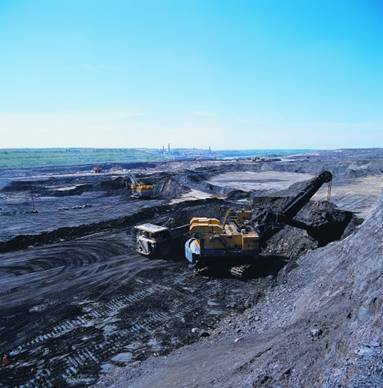 The Athabasca Oil Sands (representing about 80% of Canada’s bitumen reserves) also happens to be the only one shallow enough to lend itself to surface mining, which, as we will see, is the primary method for removing oil sands. Oil sands have been surface mined from this location since 1967. Venezuela’s reserves of oil sands are actually referred to as “extra heavy oil”, because the microbial process that degraded the original crude oil is slightly less complete (the deposits are younger) than what occurred in Canada, and thus the deposits are slightly lighter. Venezuela’s production capacity, however, is much smaller. And while undergoing a dramatic increase between 2001 and 2006, the IAEA estimates their production capacity at about 300,000 barrels per day. Venezuela’s largest reserve is the Orinoco oil belt. Oil sands (or “tar sands” or “bituminous sands”) refer to a mixture of sand, water, clay, and bitumen (which we have seen refers to the heaviest of hydrocarbon mixtures found in crude petroleum). The mixture is usually between 1% and 20% bitumen. The bitumen is a viscous semisolid. It is so viscous (and often solid in cold weather) that traditional oil extraction techniques will not work. Thus, the overburden is removed, and the tar sand extracted in a similar manner to the extraction of coal from a surface mine. Alternatively, the oil sand may be extracted with in-situ (latin for “in place”) methods using steam injection to change the properties of the bitumen. In “Cyclic Steam Stimulation”, a single well is drilled and cycled between steam injection and bitumen extraction. First, steam is injected at near 300 degrees Celsius for several weeks and then allowed to sit for days to weeks to allow heat to soak into the formation. The heat lowers the viscosity of the bitumen, which is then extracted through the well in the traditional petroleum extraction manner. In “Steam Assisted Gravity Drainage”, two horizontal wells are drilled through the formation, one near the bottom of the reservoir and another several meters above it. Steam is injected into the upper well. This lowers the viscosity of the bitumen, which then flows downwards toward the second well, which is used to withdraw the material. These methods are more expensive than surface mining techniques due to the energy required to heat the material, but is the only available means for bitumen extraction when a reservoir is too deep for surface mining. 1.) These sands are the remnants of a once vast reserve of crude oil that, over extremely long periods of time, has escaped or been destroyed microbiologically; thus leaving behind some bitumen and also converting the lighter crude oil into bitumen through bacterial processes. 2.) The bitumen evolved from highly organic cretaceous shales (similar to oil shale). Underground pressure forced the bitumen out of the kerogen rich shales where it soaked into existing silt grade sediments and sand bodies. In the first theory, petroleum would be formed in the traditional manner, and then converted to bitumen by some additional process. A summary of the oil formation process is presented here, and a more complete version is available on the PETROLEUM page. The process, in general, begins with the building of organic matter through the action of PHOTOSYNTHESIS. In the case of marine deposits, this begins with phytoplankton, which then enter the food chain that leads to the sedimentation of zooplankton rich in proteins, carbohydrates, and lipids. In terrestrial burial, the process begins in higher order organic life such as trees and shrubs, which then deposit primarily carbohydrates and lignin. The fraction of minerals to organic matter and the composition of the organics themselves lead to differences in the way that organic chemical reactions proceed and are catalyzed. As organic matter is buried, the process of diagenesis compacts it into organic rich sedimentary rocks. Further degrees of diagenesis then lead to the generation of kerogen which is then, through deeper burial and catagenesis, transformed through various means into crude oil and natural gas, or coal, depending on the precise conditions. In the case of oil shale and, according to the second theory, bitumen sands, the process of catagenesis is never allowed to be completed due to insufficient burial (temperatures and pressures too low). For the first theory, we allow complete catagenesis and petroleum formation; with a third component that represents eventual decay to bitumen. Diagenesis is a process of compaction under mild conditions of temperature and pressure. When organic aquatic sediments (proteins, lipids, carbohydrates) are deposited, they are very saturated with water and rich in minerals. Through chemical reaction, compaction, and microbial action during burial, water is forced out and proteins and carbohydrates break down to form new structures that comprise a waxy material known as “kerogen” and a black tar like substance called “bitumen”. All of this occurs within the first several hundred meters of burial. As temperatures and pressures increase (deeper burial) the process of catagenesis begins, which is the thermal degradation of kerogen to form hydrocarbon chains. The conditions of catagenesis determine the product, such that higher temperature and pressure lead to more complete “cracking” of the kerogen and progressively lighter and smaller hydrocarbons. Petroleum formation, then, requires a specific window of conditions; too hot and the product will favor natural gas (small hydrocarbons), but too cold and the organic matter will remain as kerogen. In the second theory of oil sand formation, vast organic deposits underwent diagenesis to form kerogen rich compacted sediments similar to oil shale. The process of catagenesis may then have occurred to some extent, but in general, the process did not reach sufficient temperature to undergo complete alteration of the kerogen. Over extremely long periods of time, some portion of this kerogen was transformed into bitumen products, which then seeped into the surrounding sands. Water makes up about 4% of the oil sand by weight. It surrounds each grain of sand (“water wetted”), keeping it separate from the oil. Without this water envelope, the oil and the sand could not be separated by the water-based extraction methods that are currently used. In fact, many of the oil sands found in the U.S. are “hydrocarbon wetted”, and thus require an alternate bitumen extraction process. Water extraction methods inject hot water into the sand mixture, which is then agitated for a period of time. This process causes the bitumen to separate out from the sand and water, where it attaches to air bubbles (because bitumen is “hydrophobic”, or prefers to mix with air over water…oil and water don’t mix) and floats to the surface of the agitation cells. After being skimmed off of the top, the bitumen is further processed to separate any remnant sand and water (with the addition of a solvent, such as naphtha). The bitumen is then ready for use as bitumen, but will likely undergo a chemical process to produce synthetic crude oil, accomplished by adding hydrogen and removing carbon from the bitumen compounds, which can then be refined as with other crude oils. Crude oil refining is described in the PETROLEUM section. · Coking is a thermal “cracking” mechanism. This means it uses high temperature to separate the carbon-carbon bonds resulting in lighter hydrocarbon chains. In short, it removes carbon and breaks large hydrocarbons into smaller ones. Because hydrogen will be required in the refining process (bitumen is carbon rich and hydrogen poor), an additional source of hydrogen (such as methane) is needed. Therefore, some other fuel in addition to bitumen is needed to produce synthetic crude oil, which adds to the cost and energy intensity (and carbon dioxide emissions) of the process (2 fuels 1 fuel). The production of one barrel of synthetic crude oil requires about 2 tons of oil sand and several barrels of water (some of which can be recycled), and successfully removes about 75% of the bitumen from the sand mixture. After separation, the sand is then returned to the mine to fill in empty space that has been mined. See these statistics and others at the Alberta government energy webpage.